Rat Ax cell line (HEV derived cells). Our Abpromise guarantee covers the use of ab23835 in the following tested applications. Flow Cyt: 1/25 - 1/100. Use 10µl working dilution for 106 cells in 100µl. ICAM proteins are ligands for the leukocyte adhesion protein LFA-1 (integrin alpha-L/beta-2). During leukocyte trans-endothelial migration, ICAM1 engagement promotes the assembly of endothelial apical cups through ARHGEF26/SGEF and RHOG activation. In case of rhinovirus infection acts as a cellular receptor for the virus. Belongs to the immunoglobulin superfamily. ICAM family. Contains 5 Ig-like C2-type (immunoglobulin-like) domains. 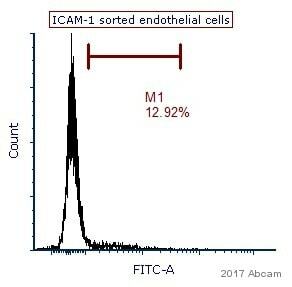 ab23875 staining ICAM1 in stimulated rat spleen cells by Flow cytometry. Publishing research using ab23835? Please let us know so that we can cite the reference in this datasheet.